I’ve been experimenting with moving some code to Drupal 8, and I’m quite intrigued by a different way that I’ve tried to structure it - using event subscribers, building on some of the takeaways from Drupal Dev Days. 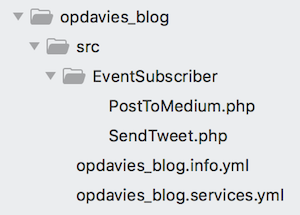 Note that there is no opdavies_blog.module file, and rather than calling actions from within a hook like opdavies_blog_entity_update(), each action becomes it’s own event subscriber class. This means that there are no long hook_entity_update functions, and instead there are descriptive, readable event subscriber class names, simpler action code that is responsibile only for performing one task, and you’re able to inject and autowire dependencies into the event subscriber classes as services - making it easier and cleaner to use dependency injection, and simpler write tests to mock dependencies when needed. The additional events are provided by the Hook Event Dispatcher module. Adding autowire: true is not required for the event subscriber to work. I’m using it to automatically inject any dependencies into the class rather than specifying them separately as arguments. // Perform checks and send the tweet.